I’m thinking about changing the structure of the posts to something more chronological, with more photos and less narrative, more tourist and less history. Let me know what you think: good, bad or indifferent. After all was said and done at Plimoth Plantation, we stopped by their Patuxant Cafe for a quick lunch. They had the usual burgers, but also a 17th century and Native inspired menu. Kathie and I shared stuffed quahog and 17th century cheesecake. Quahog is a hardshelled clam and it was stuffed with a corn bread mixture. And what makes cheesecake 17th century? Lots of currents and spice, and no sugar. “We were supposed to land in Virginia!” groused the woman in 17th century garb, sitting on the top deck of the Mayflower II. We sympathized. If they had, maybe a near 50% of them would not have died their first year in the colonies, as they did in Massachusetts. The Mayflower was the circa 1605 merchant ship that brought the 102 English colonists to Plymouth in 1620. Her original destination was Virginia, but gale winds forced her landing in Massachusetts instead and the colonists eventually decided (and regretted, once winter came) to stay. Mayflower II is a reproduction of the Mayflower, made in Devon, England for Plimoth Plantation in 1955. It’s anchored in downtown Plymouth, about 3 miles northeast of Plimoth Plantation. Be warned: parking in downtown Plymouth is difficult. Tradition has it that the Plymouth colonists landed on a site now called Plymouth Rock. It’s almost certainly not true, but you know how stories gain a life of their own. A small piece of the rock is on exhibit, on the other side of a small park from the Mayflower II. “It’s just a rock!” said one disappointed child to his mother. Yes, but it’s a rock covered by a neoclassical pavilion. Our next destination was Pilgrim Hall Museum and we walked down Water Street to get there. 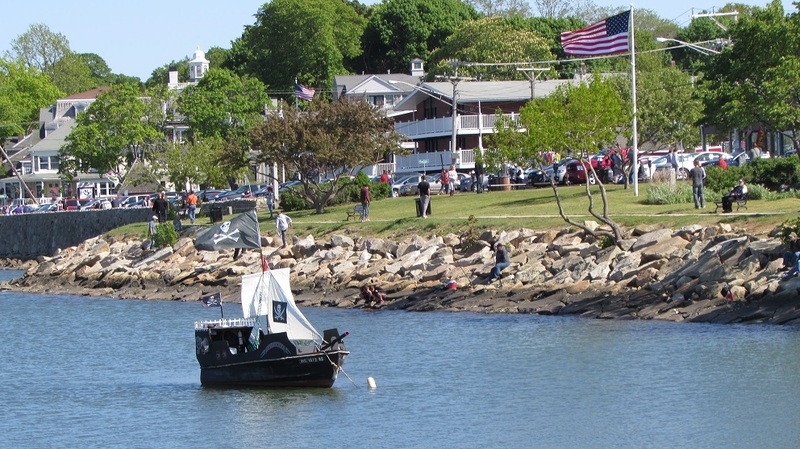 Plymouth is a tourist town equally divided between sea-themed tourist shops and historic statues and attractions. So our slow stroll involved lots of reading of historic markers, looking at statues and peering into shop windows at pirate-wear. Did you know that since 1970, Native Americans have been gathering at Plymouth on Thanksgiving Day to observe a day of mourning? I didn’t either, until I read it on a sign on Water Street. Pilgrim Hall is a small museum with paintings and displays on local history. I can’t say I was hugely impressed. All I remember are some beautiful stained glass windows in the reception area, and room-sized painting of (I think) the colonists landing. No photographs allowed. We were heading back toward the docks after we finished Pilgrim Hall Museum (30, maybe 40 minutes max) when there, in front of us, was Wood’s Seafood. It’s #3 on Trip Advisor’s list of the best restaurants in Plymouth, and #1 among the seafood restaurants. It was still a little early for dinner, but we were there and we were hungry so a clam fry — fresh and local — capped our day. Gallery | This entry was posted in Massachusetts and tagged Mayflower II, pilgrims, Plimoth Plantation, Plymouth Rock, Wood's Seafood. Bookmark the permalink. I like the more history… At least so far. But the quahog looks interesting – was it good? Neither the quahog nor the 17th century cheesecake was anything that I’d go rushing to eat again. The quahog dish was salty, bready and slightly fishy. Not sure that it was an accurate representation of the quahog clam or it was just the way that they prepared it. Dear HT, I also am a fan of the history…and enjoy your blogs. Thank you. I’ve been wondering if people are saying: “Forget the extras, just show us where you’ve been and move on.” Maybe not. I saw a reproduction Mayflower in Boston UK, it might have been the same one, I was surprised how small it was! It was tiny — can’t image 130 people on it. The woman said that passangers weren’t allowed on deck during the passage. It makes me seasick just thinking about it. Thank you! I was wondering if people prefered less story-telling and more travel facts. So far, the vote seems to be for the history and stories. Puritans totally got ripped off, they would have been so much better living on the Chesapeake. How different the history of New England would be without 400 years of Puritan influence. Definitely history over travel, though I have to say the fresh clams at Wood’s were the best I have had in a long time! Definitely less harsh conditions in Virginia. Can’t imagine what it was like their first winter in New England. “It’s just a rock!” said one disappointed child to his mother. Yes, but it’s a rock covered by a neoclassical pavilion.” – funny. There have been several times when I have been to an historic site or looked at famous objects and thought, “That’s it?” Sometimes the myth/spin is much better than the reality. I laughed so hard, inside, when I heard that child say that, because I’m sure that’s what every single person there was thinking. I think Plymouth Rock is more a monument to the art of historical myth making than it is a memorial to the pilgrims. Don’t know what the final count was, but I enjoy the history in your blog too. Thanks. Seems like everyone was for continuing the old way so that’s the way I’ll keep going. Until I get another bright idea….